I started attending Valley Daffodils’ sessions with my son Luc (below)who has Downs syndrome and his younger brother. The inclusive sessions, for any disability, provide a safe environment in which to have fun and allow friendships to be made. This group gave Luc access to a variety of fun activities that catered for his needs and for Luc not to be judged, which was becoming more as he got older. The activities have equally catered for my other son meaning we can do family days rather than split up. The sessions also supported me, by meeting other parents who are experiencing similar challenges. But the main reason was seeing both boys have a great time as you can see below. The wide variety of activities that allows both boys to have so much fun, often have to be subsidised. 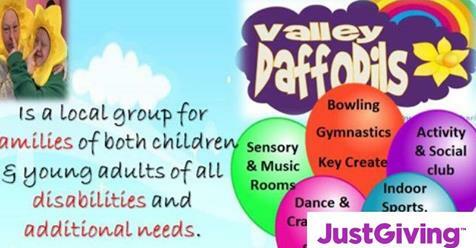 So the dedicated team of volunteers are raising money to provide further sessions, buy equipment, such as sensory toys, x box gaming equipment, craft items and venue and bouncy castle hire. There are four of us doing the sky dive which will allow us to introduce more activities for the children and subsidise current ones. So if you could spare a few £’s we would all really appreciate your generosity. Please help us make kids happy !